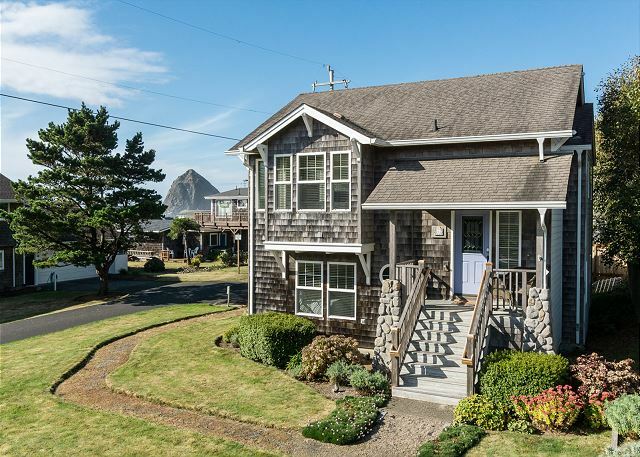 Please note - due to Cannon Beach rental regulations this home requires specific check-in days year round. Please contact us for details. 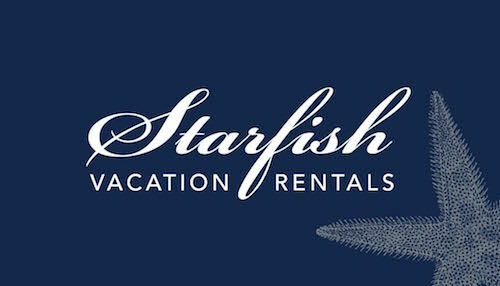 3-Night Minimum during Off-Season and 7 night minimum for Peak Season. As far as proximity to the beach, high-quality décor and amenities, and thoughtful provision of everything you might need during your stay, you can't beat The Nordic Star. 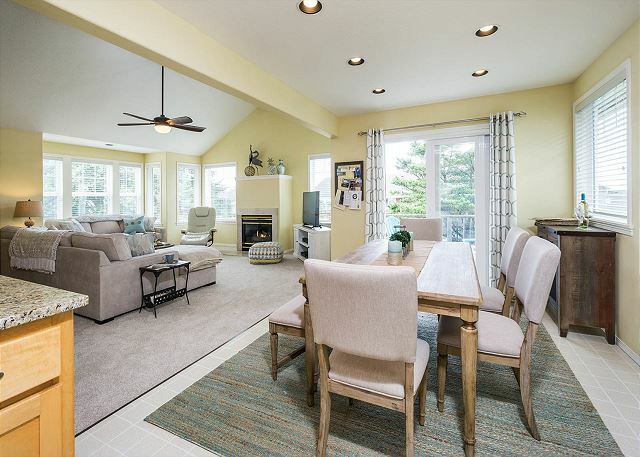 Located on a quiet dead-end street, just steps to the sand, and close to Haystack Rock and the top-rated dining and shopping experiences in Cannon Beach, this amazing home makes the perfect vacation retreat. 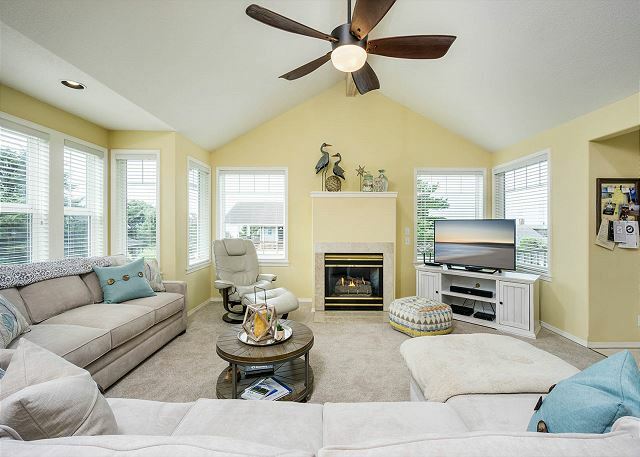 Upstairs living area: - Large windows frame partial views of the famous Haystack Rock and the Needles. - The deck is a great spot to read, chat, or grill up a meal on the gas barbeque. - The living room's gas fireplace provides a warm ambiance when the weather turns cold. - A 49-inch HD TV with cable and Blu-ray player make movie nights at home an appealing option. - You can stretch out or curl up to enjoy the large, cozy sectional sofa, which has a queen sleeper for extra sleeping options. - This floor has a lovely half-bathroom. Kitchen and dining room: - The chefs among you will vie for the pleasure of cooking in this gleaming, modern kitchen. 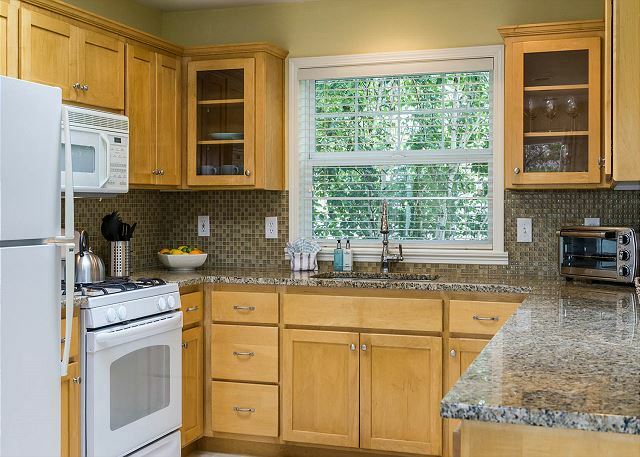 - It's got quartz countertops, a gas range, and a full array of cookware, dishes, glasses, etc. 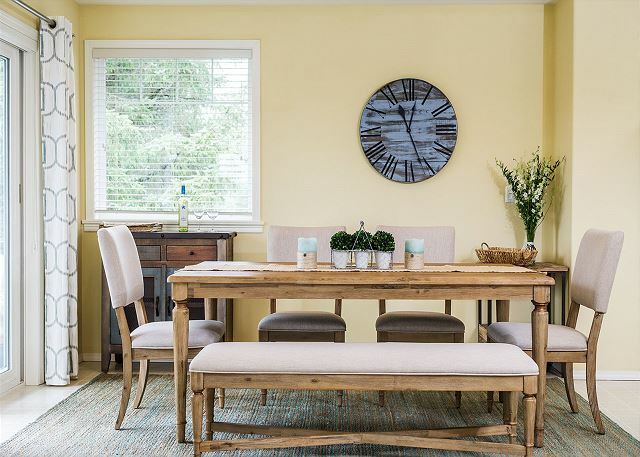 - Eight of you can gather comfortably around the table in the light, airy dining area. 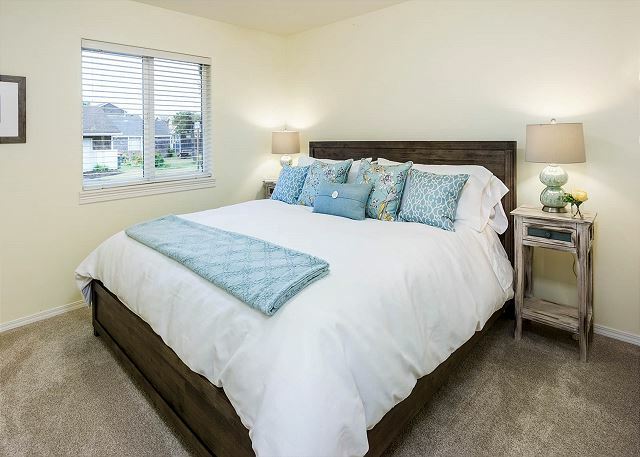 Master suite: - You'll sleep blissfully in the king-sized, pillow-top bed wrapped in sumptuous linens. - The bedroom has a cable-equipped 37-inch flat-screen television/DVD combination. - The suite includes a private master bathroom with walk-in shower. 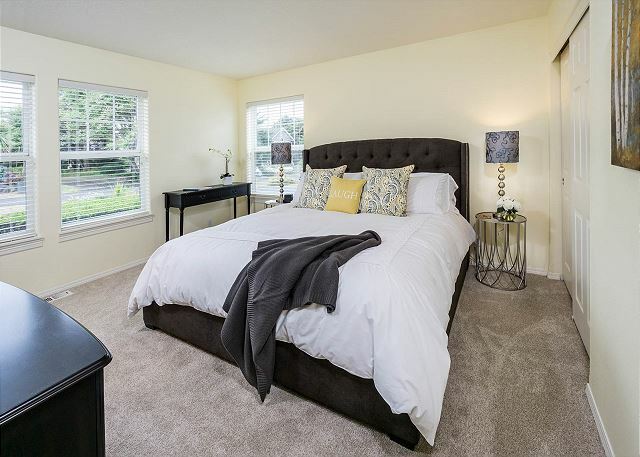 Second bedroom: - Sink into the luxurious king-sized pillow-top bed and down comforter in this bedroom. 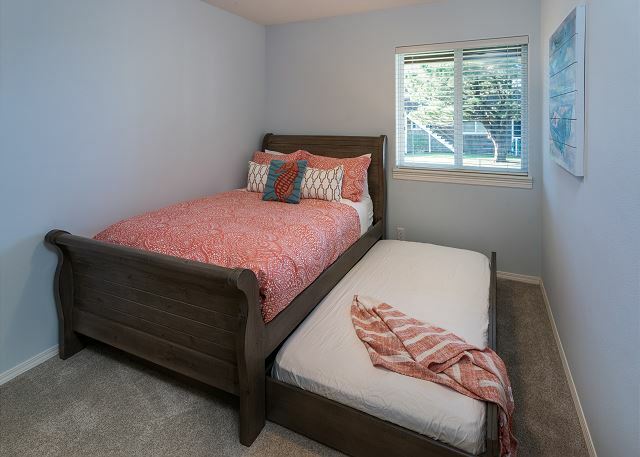 Third bedroom: - Guests will be charmed by this room's double sleigh bed and its pull-out twin trundle. - Bedrooms two and three share a bathroom with tub/shower enclosure. Additional features: - The house offers easy parking, with three reserved spaces, including one in the garage. - Clothes get grubby while you were out hiking, crabbing, beachcombing, etc.? No problem—the house has a laundry room with washer and dryer. - Grab the handy beach towels, chairs, and umbrella and you're ready to hit the beach. - Nothing feels better after an active day on the coast than taking an outdoor shower, especially when it offers both cold and hot water! Right in the neighborhood: - It's a vacation—indulge yourself with amazing coffee and freshly baked breads from the Sea Level French Bakery, just a short walk away. - At Surfcrest Market, also within walking distance, you can pick up s'mores makings and rent three-wheeled bikes for some fun on the beach. - Feel like cooking? Visit Fresh Foods grocery store a few blocks away to stock up on gorgeous local, seasonal produce, natural and organic foods, and even a great gluten-free and dairy-free selection. 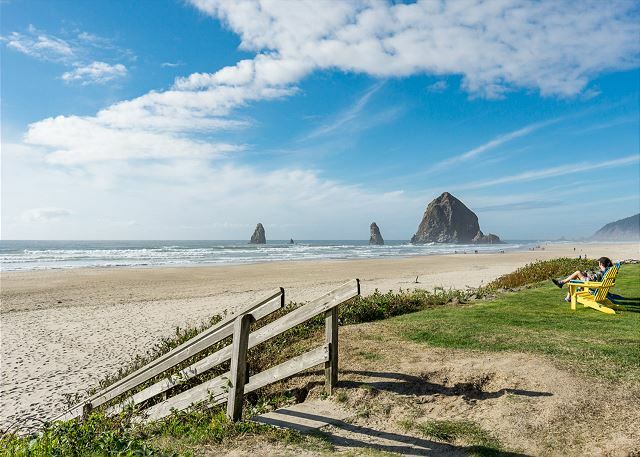 - From fine arts, prints, and sculpture to metalwork and pottery, Cannon Beach offers a variety of beautiful art galleries for you to peruse right in town. - For stunning blown glass pieces and live glassblowing demonstrations by accomplished glassblowing artists, Icefire Glassworks studio is minutes away and should not be missed. - Consider treating yourself to a meal at one of several top-rated restaurants near the house. Just one block away, the famed Stephanie Inn serves unforgettable Pacific Northwest breakfast and dinner fare, and just a little further, you'll find truly exceptional French Italian cuisine at Newmans at 988.